The main house at Slättåkra Manor can serve as a fantastic home for multi-generational living, a great place for a business, or a first-class inn with overnight accommodations and conference facilities, all in surroundings noted for their natural beauty. This property is located in the Söderslätt (southern plain) area close to Anderslöv, 15 minutes from the southern coast of Sweden, 30 to 40 minutes from Trelleborg or Malmö, 20 minutes from Sturup Airport and 50 minutes from Copenhagen. The building consists of three storeys with a tremendous residential area of 785 m2, and with beautiful features throughout, such as ceiling murals, stucco mouldings, stucco rosettes, lovely parquet and stone floors, tiled stoves and fireplaces. The high ceilings and big windows provide abundant natural light and create a feeling of spaciousness in all the rooms, especially in the lounges, living room and billiards room on the second level, which are located in a row. The first level of the house has a ceiling height of about 2.10-2.25 metres and a main entrance area leading to the second level via a bright, beautiful stairway, as well as a private entrance from the front side. The office area has a separate entrance from the north side. This part of the first level has five rooms and a lavatory and can be converted to an apartment with an area of more than 120 m2. This section also has a large guest room with an en suite bathroom. The other section of the first level consists of storage rooms, machine rooms and a large laundry room. The second level with a ceiling height of about 3.5 metres is reached via the beautiful staircase from the ground floor. This brings you through an inviting foyer to a library with beautiful custom-built traditional bookshelves. Next to the library is an office that can also be reached from the foyer, where there is a lovely staircase leading to the third level. Next to the office there is a wardrobe and a guest lavatory. The large billiards room forms a row together with the salon and living room, which have doors that lead out to a glassed-in veranda facing south. There are stairs leading from the veranda down to the pool area. The room also opens on the magnificent formal dining room. Next to the dining room is the kitchen, which is fully equipped and, in addition, includes a large eating area. Next to the kitchen is a service entrance from ground level, with stairs leading up to the kitchen. The third level has a ceiling height of about 2.9 metres, and can be reached either via the main stairway or by a small kitchen staircase located in the western section of the house. A long corridor links together five rooms, two of which have tiled stoves. The master bedroom faces south and west and has an en suite bathroom with a Jacuzzi and shower area, as well as an adjacent walk-in closet. The corridor has an additional bathroom with a shower, as well as a toilet. Each of the four other bedrooms has its own handbasin. The hall also has a linen closet. 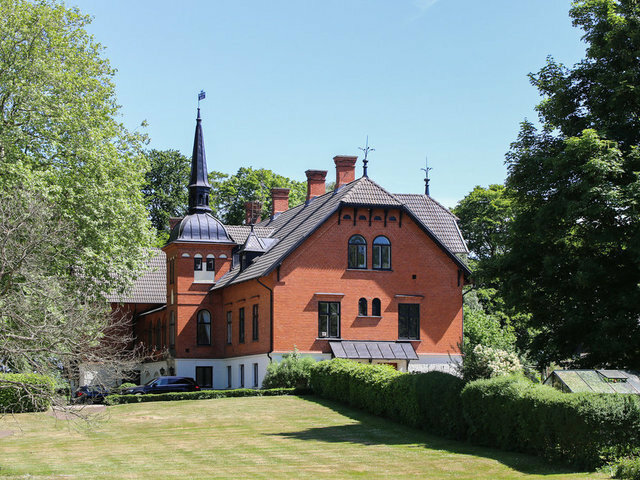 The grounds around the building include a beautiful driveway approaching from the east, a courtyard toward the north that features a majestic leafy tree, which, according to an old Swedish tradition, helps to protect the family. The courtyard borders on a large building situated on the neighbouring property, sections of which you can rent. South of the building, there is a wonderful pool area set amidst lush greenery. The pool, which was built in 2003 measures 12 x 6 metres and includes a sun cover and a tin roof. The pool can be connected to a heating pump. Next to the pool, there is a l0 m2 storage building, as well as a 15 m2 orangery. The large park grounds are truly lush and beautiful with three small lakes and good fishing, including perch and pike. The property also has great place duck hunting.